Ganesha - God of good fortune. - Hindu God. Ganesha is a God of good fortune wisdom and literature. Home ¦ Divinity of the Day ¦ Hindu Gods and Goddesses ¦ Ganesha - God of good fortune. Ganesha - God of good fortune. Ganesha is a God of good fortune, wisdom and literature. He is depicted with the head of an elephant. 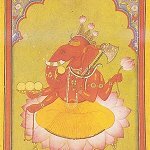 He is popularly worshipped as a remover of obstacles.